Background: Seed of Guñjā (Abrus precatorius Linn. ), a known poisonous drug, is used extensively in various ayurvedic formulations with great therapeutic significance. Ayurveda recommends the administration of Guñjā in diseases like Indralupta (alopecia), Śotha (edema), Kṛmi (helminthes), Kuṣṭha (skin diseases), Kaṇḍu (itching), Prameha (urinary disorders) etc., after being treated with specific Śodhana (purification) procedures. Methods: Guñjā seeds after being processed with Godugdha (cow's milk), Nimbu swarasa (Lemon juice), Kāñjī (Sour gruel) and water, as the media, were evaluated for its antibacterial effect against clinically important bacterial strains using agar well diffusion method. Conclusion: The study displayed that chloroform extracts of raw and śodhita samples for bacterial study were much sensitive than the aqueous extracts. Ayurveda recommends the administration of Guñjā, in diseases like Indralupta (alopecia), Śotha (edema), Kṛmi (helminthes), Kuṣṭha (skin diseases), Kaṇḍu (itching), Prameha (urinary disorders) etc., after being passed through specific śodhana (purificatory procedures). Leaves, stem, seed, seed oil of Abrus precatorius have been reported for their antibacterial and antifungal activities.,,,,, The antibacterial effect of śodhita (purified) Guñjā seed hasn't yet been reported. In the present study, an attempt has been made to assess the antimicrobial action of Guñjā seeds, being processed through Godugdha (cow's milk), Nimbu swarasa (Lemon juice), Kāñjī (Sour gruel) and water as the media, against clinically important bacterial strains. The plant Guñjā (Abrus precatorius L., Fabaceae), was selected from the surroundings of Jamnagar, Gujarat, in their natural habitat, by an expert plant taxonomist and its mature seed (red variety) were collected during the month of November - January, 2012 and the plant specimen was submitted to the departmental museum of the institute for future reference. The fully matured dry seeds were first dropped in a beaker containing water. The seeds which floated on the surface of water or those which were damaged, or had faded in color were discarded. The seeds, which settled at the bottom of the beaker were selected for purification after air drying and stored, as RGS, in a glass jar, for śodhana purpose. Stainless steel vessel (20 cm × 30 cm); capacity of 7 L., used as Ḍolayantra, stainless steel rod (28 cm), stainless steel vessel (48 cm × 30 cm × 7 cm); capacity of 3 L., cotton threads 30 cm in length, measuring mug (capacity of 1 L), muslin cloth (45 cm × 45 cm), digital weighing machine, digital induction cooker, stainless steel spatula (length: 30 cm), and measuring cylinder (10 ml, 25 ml). In this study, Śodhana of Guñjā seeds was carried out by one of the classically approved methods. Each Śodhana procedure was repeated three times to validate the pharmaceutical processing. Śodhana of Guñjā was performed by the process of Svedana (boiling) in Godugdha. One hundred grams of raw Guñjā seeds (RGS) were placed in a muslin cloth and made into a poṭṭalī. The poṭṭalī was hung in a steel vessel and freshly collected Godugdha was filled in the vessel, up to the complete immersion of the poṭṭalī as per standard Swedana procedure. This vessel was heated on an induction stove, for six hours at 100°C, throughout the experiments. Total seven liters of Godugdha was utilized for one batch throughout the process. After boiling for six hours, the seeds were taken out from poṭṭalī and washed with lukewarm water. After washing with lukewarm water, seed coat was manually removed and kept on a paper sheet, for the shade drying. After proper drying, the seeds were collected and stored in air tight glass container and being labeled as 'Godugdha śodhita Guñjā seed' (GSGS) and the percentage of weight loss also was calculated by the following formula. Same procedure was followed for the Śodhana of Guñjā seed with Nimbu swarasa, Kāñjī and water (obtained from Reverse Osmosis plant) and the final product was labeled as Nimbu swarasa Śodhita Guñjā seed (NSGS) Kāñjī Śodhita Guñjā seed (KSGS) water Śodhita Guñjā seed (WSGS). The raw (RGS) and śodhita Guñjā (GSGS, NSGS, KSGS and WSGS) seeds were powdered with mechanical grinder and passed though mesh no. 60. These powdered materials used for the preparation of plant extracts to check their antibacterial potential. Five grams of all five powdered samples i.e., sample 1-5 were extracted with 100 ml of solvent i.e., aqueous (water) for 24 h (Shaking for 18 h and then kept aside as stand by for 6 h). Then extracts were filtered and all the solvent were evaporated and the residue was collected. The residues were then dissolved in the respective solvent i.e. water to make certain concentration i.e., sample of concentration 250 μg/ml. Same process was followed for extraction of samples with chloroform. The residue obtained dissolved in dimethyl sulpho-oxide (DMSO) to make a sample of concentration 250 µg/ml. At first bacterial strains were cultured in liquid medium i.e. in broths. For bacterial cultures 1.3 gm of nutrient broth medium (Himedia) was dissolved in 100 ml distilled water in conical flaks (pH- 7.2). Then medium was sterilized by autoclave at 15 lbs pressure for 20 min. Then the bacterial strains were inoculated into their respective medium in a laminar air flow chamber from stock culture using inoculating needle. All of the inoculated cultures were incubated in BOD incubator at 28°C or 37°C on the basis of their temperature requirements. After 24 h the bacterial cultures were used for antibacterial studies. Antibacterial potential of the plant extract were tested by agar well diffusion method. To check the antibacterial potentiality 100 μl of bacterial and cultures were spread on the culture medium (nutrient broth medium) using a glass rod spreader. Then wells were prepared by cork borer and 50 μl of plant extracts were added in each well separately. Then the plates (one plate per bacterial strain) were incubated in BOD incubator at 37°C. For bacteria, plates (one plate per bacterial strain) were observed after 24 h of incubation. Then the diameters of zone of inhibitions by plant extracts were measured and tabulated. A broad spectrum antibiotic oxytetracycline (10 μg/ml) was used as positive control for anti-bacterial study. The toxic principles present in the plant drugs are also reported as their active constituents., Therefore, it is not desirable to expel them out completely from the drugs. The main aim of Śodhana process is to reduce the toxic constituents to some extent or by potentiating their chemical transformation to non-toxic or relatively less toxic substances. There may be some new principles added during śodhana process to the drugs, which are responsible for enhancing their biological efficacy. Hence, maximum beneficial effect can be obtained by administering the Śodhita drugs within their therapeutic dosage limit. During Śodhana of Guñjā with different media, change in color of those media was noticed and it might be due to the removal of color containing materials from the endosperm of the seeds. The reddish cream color powder of raw seeds turned into brownish color in case of Godugdha śodhita Guñjā seed, creamish yellow color in case of Nimbu swarasa śodhita seed, yellowish brown color in case of Kāñjī śodhita seed and ash color in case of water śodhita Guñjā seed after Śodhana [Table 1]. After performing Śodhana it was observed that 85.96%, 83.9%, 88.2% and 91.66% of purified Guñjā were obtained after purification in Godugdha, Nimbu swarasa, Kāñjī and water respectively [Table 2]. This might be due to the extraction of more soluble mass from the seeds by all three media than water. 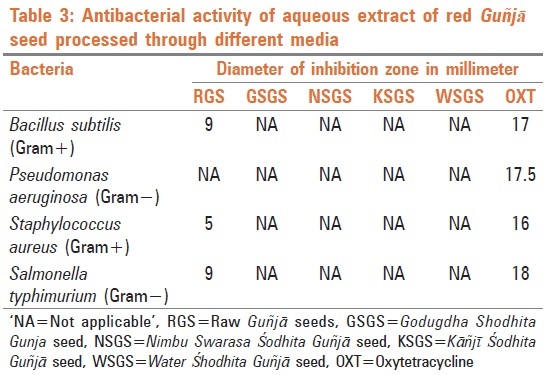 The zone of inhibition of aqueous extract of RGS and four Śodhita Guñjā seeds are shown in [Table 3]. After 24 h of incubation period of aqueous extracts, it is evident that only the raw seeds of Guñjā can exert antibacterial effect on both Gram positive, as well as Gram negative bacteria but none of the śodhita Guñjā seeds showed any bactericidal effect on any bacterial strains [Table 3]. Chloroform extracts of five samples for bacterial study showed greater inhibitory activity in comparison to aqueous extract. All the śodhita Guñjā seed extracts could inhibit bacterial growth but with variations. The Gram positive bacteria Staphylococcus aureus and Bacillus subtilis were found most sensitive by the śodhita chloroform extracted samples and produced larger inhibition zones. 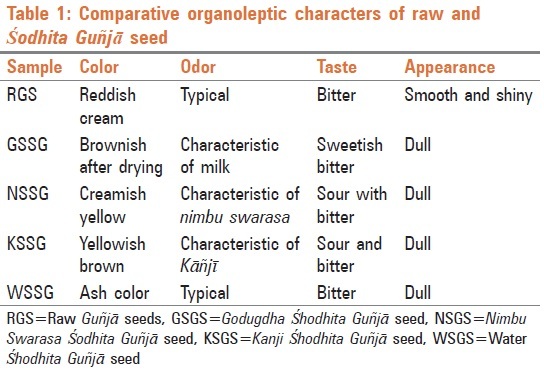 Among all the samples Kāñjī śodhita Guñjā seed shows more significant results against all the bacteria in comparison to others shown in [Table 4]. 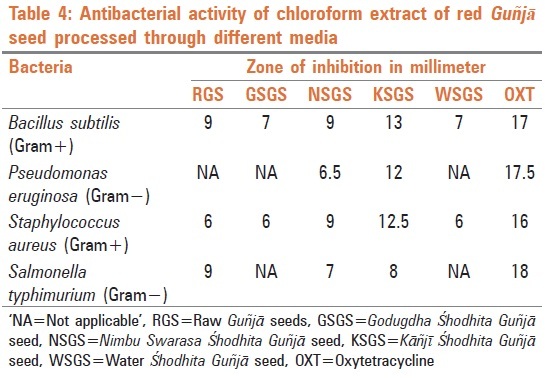 The chloroform extract of Kāñjī śodhita Guñjā seeds produced inhibition zones of 12-13 mm against bacterial strains. This is closely comparable with that of standard broad spectrum antibiotic oxytetracycline which normally produced 16-18 mm inhibition zones against these bacteria at 10 µg/ml concentration [Figure 1]. From this study, it may be concluded that, chloroform extract shows greater inhibitory effect than the aqueous extracts. It is also found that Kāñjī śodhita Guñjā seed have more antibacterial effect than the other samples. 1. Sharma PS. Rasatarangini. In: Kasinathshastrina P, editor. Delhi: Motilal Banarasidas; 2009. p. 676 and 727-730. 2. Gogte VM. Ayurvedic pharmacology and therapeutic uses of medicinal plants. Mumbai, India: Bharatiya Vidya Bhavan; 2000. 3. Ilanchezhian R, Roshy JC, Acharya R. Importance of media in shodhana (purification/processing). Anc Sci Life 2010;30:27-30. 4. Mitra S, Shukla VJ, Acharya R. Effect of Shodhana (processing) on Kupeelu (Strychnosnux-vomica Linn.) with special reference to strychnine and brucine Content. Available from: http://www.ayujournal.org [Last accessed on 2011 Jul]. 5. Patel Y, Bhat Savitha D , Acharya R, Ashok BK, Shukla VJ. Role of sodhana on analytical parameters of Datura innoxia Mill. and Datura metel Linn. Seeds. Int J Res Ayurved Pharm 2010;2:249-54. 6. Sarkar PK, Prajapati PK, Shukla VJ, Ravishanka B. Evaluation of effect of shodhana process on pharmacological activities of aconite. Ind J Pharm Edu Res 2010;46:243-7. 7. Sastri JLN, Dravyaguna Vijnana. 1 st ed. Vol. 1. Varanasi: Choukhamba Orientalia; 2009. p. 691. 8. Parikh CK. Parikh's Test book of Medical Jurisprudence Forensic Medicine and Toxicology. 6 th ed. Darya Ganj: CBS Publishers and Distributors (India); 2007. p. 9.31- 11.16. 9. The wealth of India, Raw materials. Vol. 1: A. Revised version. New Delhi: Council of scientific and Industrial Research; 2003. p. 18-20. 10. 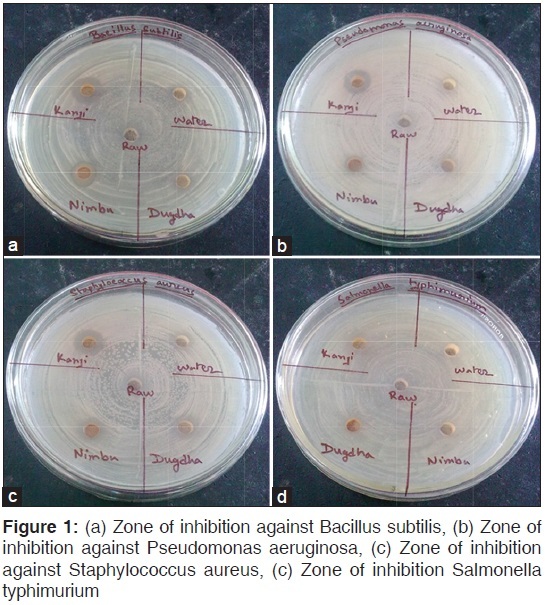 Kekuda TR, Vinayaka KS, Soumya KV, Ashwini SK, Kiran R. Antibacterial and antifungal activity of methanolic extract of Abrus pulchellus Wall and Abrus precatorius Linn: A comparative study. Int J Toxicol Pharmacol Res 2010;2:26-9. 11. Sreeramulu J, Reddy JR, Reddy YP, Geethavani M. Antimicrobial activity of seeds of Abrus precatorius Linn. Asian J Chem 2009;21:1630-2. 12. Adelowotan O, Aibinu I, Adenipekun E, Odugbemi T. The in-vitro antimicrobial activity of Abrus precatorius (L) fabaceae extract on some clinical pathogens. Niger Postgrad Med J 2008;15:32-7. 13. Alli AI, Ehinmidu JO, Ibrahim YK. Preliminary phytochemical screening and antimicrobial activities of some medicinal plants used in Ebiraland. Bayero J Pure Appl Sci 2011;4:10-6. 14. Bobbarala1 V, Vadlapudi V. Abrus precatorius L., seed extracts antimicrobial properties against clinically important bacteria. Int J Pharm Res Develop 2009;1:1115-8. 15. Parekh J, Chanda SV. In vitro antimicrobial activity and phytochemical analysis of some Indian medicinal plants. Turk J Biol 2007;31:53-8. 16. Bauer AW, Kirby WM, Sherris JC, Truck M. Antibiotic susceptibility testing by a standardized single disk method. Am J Clin Pathol 1966;45:493.